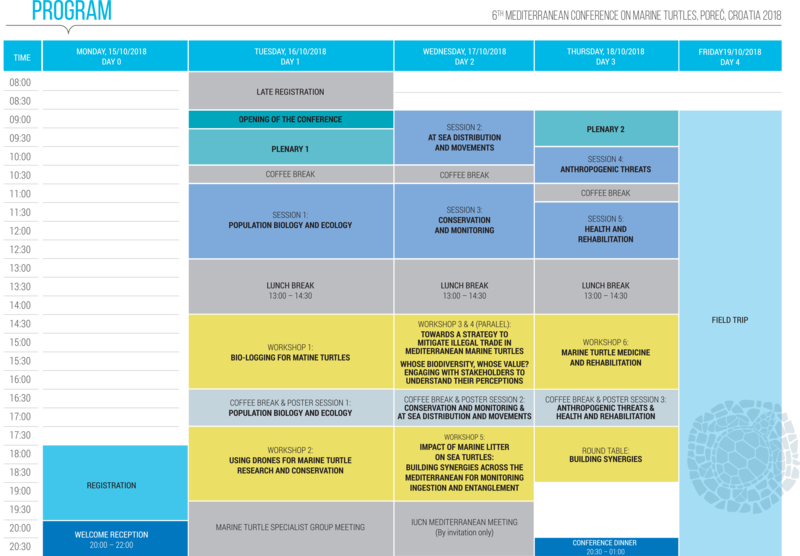 More than 150 registrants, 30 oral and over 90 poster presentations assigned to five thematic sections, six workshops and two plenary talks – this is how the Conference looks like in numbers! We present you with an exciting, dynamic and interactive meeting, from which we can all take home some new knowledge and practical skills. Therefore, thanks to a remarkable job done by the Scientific Committee, we have greatly limited the number of oral presentations, which will be held just during the morning sessions. Whole afternoons are dedicated to practical activities, workshops and poster sessions, or you can just use this time to talk to your Mediterranean colleagues, arranging new collaborations and projects. In that way each participant can shape the conference based upon individual interests and needs. The program ends with a round table discussion referred to the conference theme: building synergies. How can we move sea turtle conservation to a higher level through integrative, multi-taxa conservation planning? By using cumulative knowledge of conference participants, experience of international conventions and expertise of our plenary speakers we hope to explore new approaches and collaborative opportunities that can benefit to our common conservation goals. Book of Abstract, including detailed program of the conference can be downloaded here. 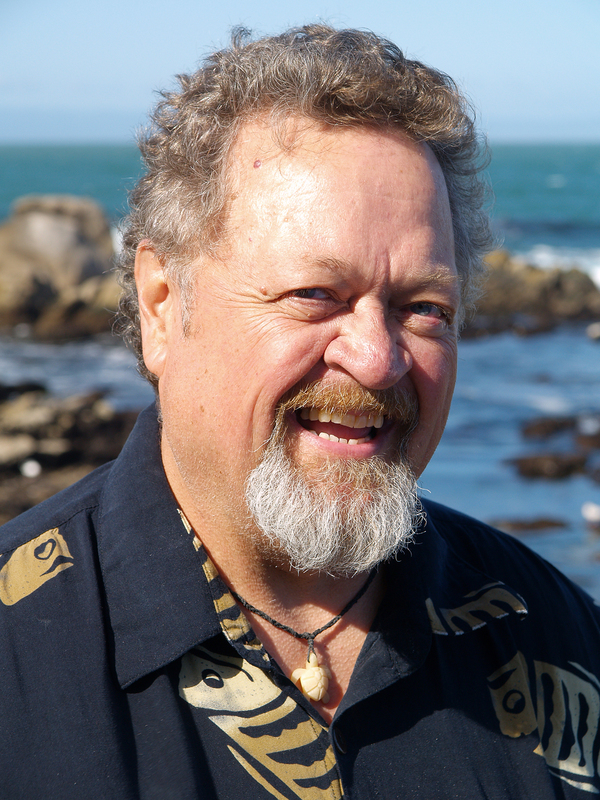 Dr. Crowder is Provostial Professor of Marine Biology and Conservation at Hopkins Marine Station of the Stanford University and Senior Fellow at Stanford Woods Institute of the Environment. He is among the leading authorities in the field of marine conservation and one of the icons if the field of sea turtle research and conservation. Dr. Crowder’s early research centered on predation and food web interactions, population and food web modeling, and fisheries ecology. His sea turtle research has focused on population dynamics, assessing bycatch risk, and quantitative analysis of spatial data to understand the behavior and dynamics of sea turtle populations relative to threats, particularly at sea. Over time he has emphasized reducing mortality of large juvenile and adult turtles at sea by evaluating the impacts of fishing gears, modeling spatial dynamics of turtles and threats in the context of dynamic ocean management, and most recently examining the impact of climate variability on these interactions. Dr. Crowder has led a number of large interdisciplinary research projects including SABRE (South Atlantic Bight Recruitment Experiment), OBIS SEAMAP (Spatial Ecological Analysis of Megavertebrate Animal Populations), and Project GLOBAL (Global Bycatch Assessment of Long-Lived Species). He directed the Center for Marine Conservation at Duke University and the Center for Ocean Solutions at Stanford University. His recent research has focused on interdisciplinary approaches to marine conservation, including bycatch, spatial ecological analysis, sustainable seafood, ecosystem-based management, marine spatial planning, and governance. Dr. Fortuna is a senior researcher at the Italian National Institute for Environmental Protection and Research (ISPRA) and one of the leading experts in the field of cetacean research, with 25 years of work experience in research and conservation management of large marine vertebrates (cetaceans, sea turtles and elasmobranchs). 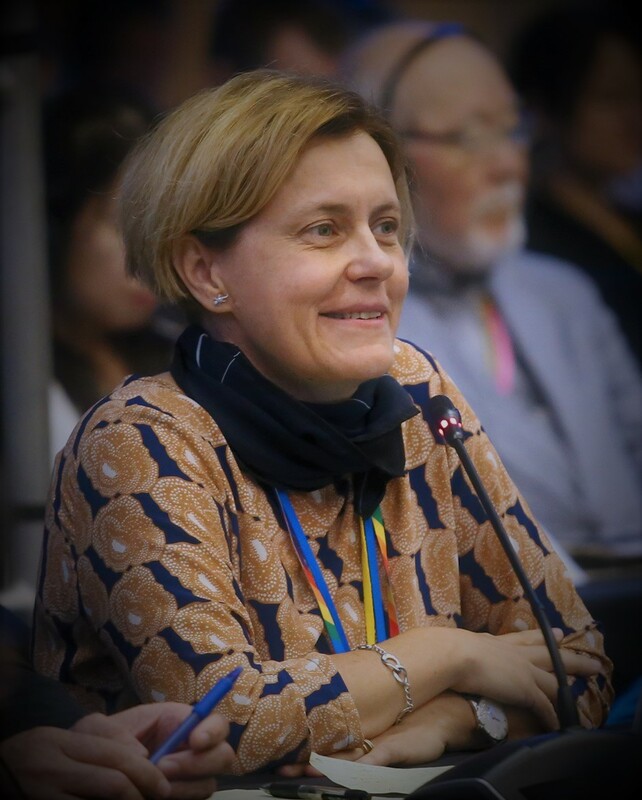 Her main interests include population dynamics of species of conservation concern; bycatch risk assessment on protected species; and international conservation policies (i.e. 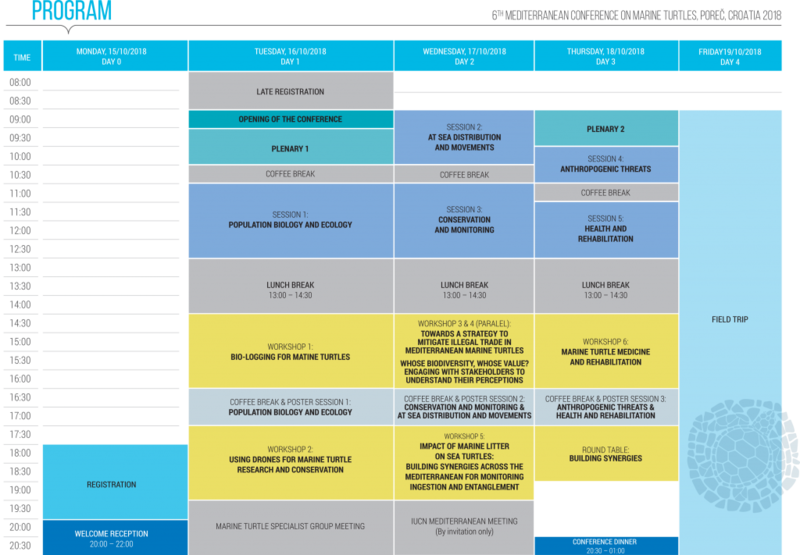 EU legislation, international Conventions and regional Agreements). She has been a member of International Whaling Commission Scientific Committee since 2001 and served as Chair of the Scientific Committee for the last three years. She is member of the IUCN Cetacean Specialist Group since 2006. The three-hour session is intended to bring together sea turtle researchers that are experienced, novice and just interested in using UAVs or drones. The primary aims are to continue dialogue on the best use of UAVs for sea turtle studies and catalyse a network where technical advances and method development are shared. The session would be divided into two interactive parts, where the attendees are encouraged to ask questions to the presenters and the group at large. Telemetry and bio-logging devices are returning increasing amounts of information about marine animals from all the major taxa of top predators, including fish, birds, mammals and marine turtles. In ever-increasing detail, these devices provide information on where turtles go, how they behave and, to some extent, provide information on both the underlying physiological mechanisms and the environmental conditions surrounding them. Today’s rapid progresses in technology provide us with tools to study cryptic aspects of marine turtle biology that only a decade ago we could only dream of. However, with the increasing number of telemetry applications we are also facing a new challenge of handling and analyzing big data sets, so that the gathered information can be made available not only to the scientific community but to wildlife conservationists and decision makers as well. Ultimately, with the power of knowledge comes great responsibility and researchers have to juggle constantly between the need to develop evidence-based policies on the base of bio-logging data and the raising concern about animal welfare. A first specific workshop on bio-logging techniques employed in the study of marine turtles was held at the 35th ISTS in Dalaman, Turkey, and was received with much enthusiasm and interest. Encouraged by this response, this follow-up workshop is intended to gather everyone in the Mediterranean who applies or nurses an interest in bio-logging techniques and to provide a general technological background and explore recent advances in the field. Special emphasis will be given to bio-logging studies in the Mediterranean exploring what has been done and what not, highlighting both acquired knowledge and remaining gaps that can be filled using the bio-logging approach. Moreover, the workshop is contextualized in the conference theme of “Building Synergies”, since bio-logging instruments are also widely applied to studies on other marine megafauna that share the same aims. Workshop 3: Impact of marine litter on sea turtles: building synergies across the Mediterranean for monitoring ingestion and entanglement. The ubiquitous marine litter is threatening sea turtles worldwide, in particular in the Mediterranean Sea which, because of its semi-closed configuration, the heavy urbanized coasts and the strong tourism pressure, is one of the most polluted seas in the world. Marine turtles feed in the water column and on the seafloor. Based on the species-specific feeding behaviour, these two marine compartments are addressed when quantifying litter in the digestive tract of live and dead stranded turtles. Both stakeholders acting for the conservation of sea turtles and megafauna populations, and those in charge of marine environment policies work hand to hand for defining tools which will allow to assess the status of species and environment. In the Mediterranean Sea, stakeholders are seasonally recording stranding and bycatch events of live and dead specimens of Caretta caretta, Chelonia mydas and Dermochelys coriacea which can be sampled to collect information on the impact of litter, as well as information on interactions between litter and other megafauna species (birds and marine mammals). In order to develop an operational strategy for monitoring the impacts of litter on sea turtles and better act for their conservation, the development of specific protocols for the monitoring of the amount of litter ingested by- and entangling- sea turtles and other megafauna species, as well as the collection of standardized data by the Mediterranean networks are necessary. Sharing data and results can allow the scientific community to assess the seasonal trends and to plan conservation strategies. The establishment of a standardized monitoring is fundamental to evaluate the threat related to pollution and assess the efficiency of conservation measures. This will also allow to develop indicators of impact of anthropogenic marine debris. In particular, although an indicator of debris ingestion by sea turtles is already being considered for the Marine Strategy Framework Directive and the Barcelona Regional Sea Convention, no indicator related to entanglement has been proposed in the framework of environmental policies nor is reported as such in stranding network databases. This workshop aims at sharing the lessons learned and the standard tools built by existing monitoring initiatives at the Mediterranean and European scales, in order to identify the gaps of knowledge and the tools required to better monitor the impact of anthropogenic debris on sea turtles and other megafauna and enhance possible cooperation on this issue at the Mediterranean level. One of the outputs is to enlarge the existing regional Mediterranean network and identify needs for structuring/ reinforcing capacities through training. Sea turtle stocks in the eastern Mediterranean basin suffered from severe exploitation until the mid-1960s. Estimates are of the order of 30,000 turtles (loggerheads and green turtles), captured from the end of the First World War to the 1930s. The exploitation of accidentally caught turtles follows the existence of some local traditions of the consumption of turtles meat and illegal trade in carapaces. Sea turtles have been sold until recent dates in some Mediterranean countries and are still exploited where thousands of turtles are slaughtered annually in the fish markets. Considering this situation, the MAVA project, developed within the implementation of the Mediterranean Sea turtle action plan and coordinated by SPA/RAC, is launching the elaboration of national strategies in two countries to combat the illegal trade in sea turtles. The workshop will be an opportunity to learn from the experience of other countries, identify priorities and relevant and concrete mitigation measures. Increasingly funders require project beneficiaries to assess the impact of their conservation work on the socio-economic. According to Costanza et al. (1997) “Ecosystem goods (such as food) and services (such as waste assimilation) represent the benefits human populations derive, directly or indirectly, from ecosystem functions.” However, there is a lack of knowledge of the value of biodiversity, including the value of sea turtles. The workshop will focus on available methods for assessment of the role of species of conservation concern, such as sea turtles, that is understandable to both local stakeholders and visitors, and which can help develop conservation. Exchanging experiences and procedures among the Mediterranean Sea Turtle Rescue Centres. The proposal of this workshop emerges from the evidence of the numerous sea turtle rescue centres along the Mediterranean coasts. Most of them face emergencies without the support of expertise, and a lack of information may cause waste of energy and economical resources, uncertain results, and mostly a pain for animals. The workshop is addressed to people directly involved in sea turtle rehabilitation and care, representing a rare opportunity to share rehab and medical skills, knowledge, experiences and standard operating procedures. Following the experiences made in previous Mediterranean Conferences and ISTS Symposia, we plan 2 different moments. First, some invited speakers will present brief presentations for a general audience focused on husbandry, critical care, soft tissues lesions, anaesthesia and surgery. The second moment will be the occasion for an open discussion among participants, with a particular attention to the high quality condition for management: we invite everyone to be an integral part of the debate. The discussion will help a better update of the role of sea turtle rescue centres in our area and their future perspectives, supporting the realization of a network, functional to a better emergency organization, standardization of common protocols and medical administration, and in particular high quality systems for the convalescence of sea turtles. We’ll take you to the one-day bus trip to the Sea Turtle Rescue Centre in Pula and to the Brijuni National Park. According to the legend of the Argonauts, the city of Pula was founded about three thousand years ago. The city flourished in the Roman period, when the greatest classical monuments were built, including the Amphitheatre popularly called the Arena. This Amphitheatre, used for fights and battles of men and animals, was built in the 1st century AD and could once hold up to 23,000 spectators. It is ranked as the sixth largest Roman amphitheatre still existing and it is the place of numerous cultural events. Established in the year 2000, the Sea Turtle Rescue Centre is situated in the Aquarium Pula, stationed in the remarkable Austro-Hungarian fort Verudela built in 1886. 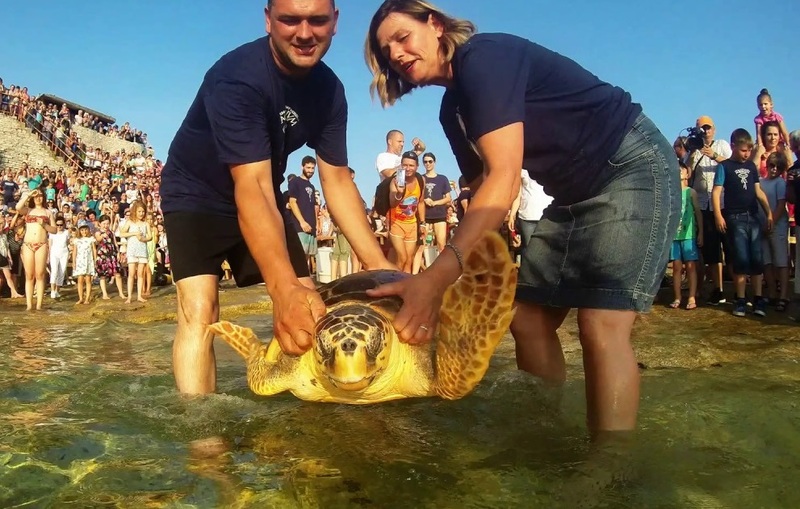 The Rescue Centre, run by the Marine Education Centre, took care of over 150 injured and ill sea turtle so far and become one of the leading institutions in the field of sea turtle medical care in the Adriatic region. Each year the Centre organizes public sea turtle releases and numerous events aimed at the conservation of the rich natural heritage of the Adriatic Sea. From Pula we’ll continue to the jewel of Istria – the Brijuni National Park, an archipelago consisting of two larger islands and 12 islets. 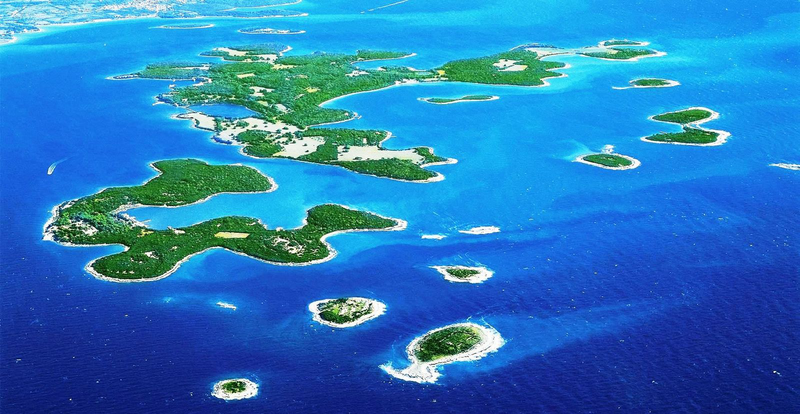 Inhabited from the prehistoric period, the islands were highly valued in the Roman times, but they become world known as the official summer residence of the former Yugoslav president Josip Broz Tito. There he hosted numerous leading politicians and celebrities, including President of Egypt Gamal Abdel Nasser, Prime Minister of India Jawaharlal Nehru, Sofia Loren, Elizabeth Taylor, Richard Burton, Princess of Monaco, etc. The National Park was established in 1983. There are almost 700 plant species and about 250 bird species on the islands, the traces of dinosaurs, remains of Antiquity and later periods, whereas the mild Mediterranean climate makes it a pleasant health resort. Moreover, the National Park is collaborating with the Sea Turtle Rescue Centre and is involved in the rehabilitation of sea turtles. The Park provides large open pools for acclimatisation of rehabilitated sea turtles, where they can actively swim and improve muscle condition, and return to active feeding before being released back to the sea. The field trip includes lunch, and the return to the Valamar Diamant Hotel is planned for 6 p.m.
We will present you with the first draft of the final report, the result of a rich experience for everyone involved. How’s the process been going so far, what was good, what not and how can we improve it? Any suggestions/comments from the floor are welcomed! Here is how the silent auction works: all participants are invited to bring one or more items as a donation for the auction. These items may be turtle-related (e.g. T-shirts, turtle-jewelry, handicrafts, education materials etc. ), but not necessarily (national souvenirs and drinks are also welcome). Each item should be accompanied by the form attached here which serves as a bidding sheet. You need to print and fill-in the auction form, and set starting bidding price (the forms will be also provided at the conference). You will hand out your items at the registration. All items, accompanied with forms, will be displayed at the conference, allowing all participants to bid for it by offering (higher) price. The best bidder gets the item. 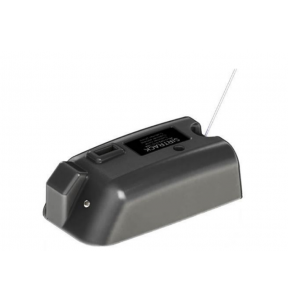 The main items for the silent auction are provided by one of the Conference’s sponsors – Lotek, donating a KiwiSat Argos satellite transmitter and FastGPS Argos transmitter or FastGPS datalogger! Specific model will be selected by the winner and made on request. 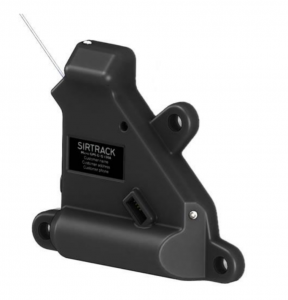 Therefore, don’t miss the chance to get your own satellite tag far below the market price! We consider this opportunity as a social event, so bring your cool stuff and help us to raise additional funds! For more info please contact the auction coordinator. Main auction items: satellite transmitters provided by Lotek (photos are just for the illustrative purpose). All Conference participants are invited to welcome cocktail, a social gathering which will take place on Monday the 15th in the lobby of Valamar Diamant Hotel, starting at 20:00 h. A little bit of food, a little bit of drink, meeting dear colleagues and friends from around the Mediterranean and Europe and catch up with news before official start of the conference – this is why you don’t want to miss it! 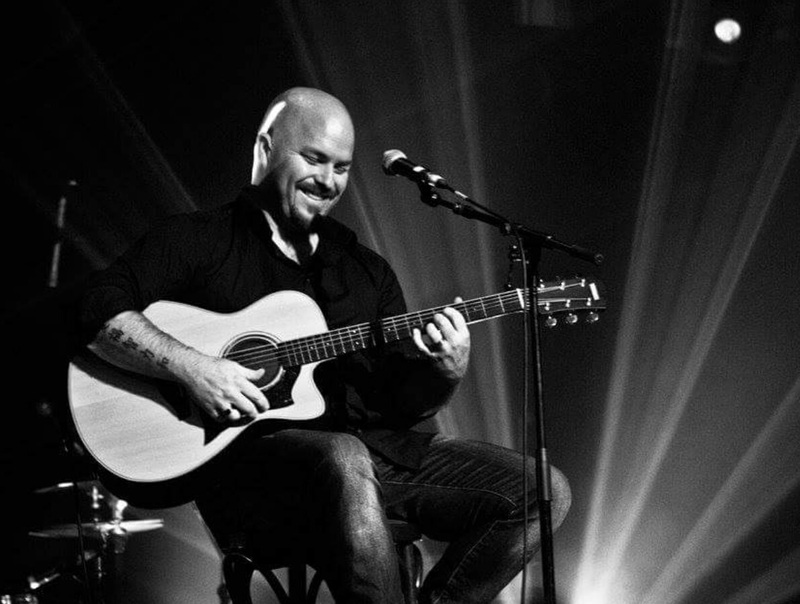 We have prepared a small surprise for you and invited Mr. Sanjin Banic, known blues & rock singer, guitarplayer and songwriter from Croatia, who performed at numerous stages across Europe and USA. See you on Monday at 20:00! The official conference program ends on Thursday the 18th, so it is the right time to relax and celebrate a good time we’ll have in Porec and closure of another Mediterranean Conference on Marine Turtles. We’ll do that at the banquet dinner organized on October the 18th, starting at 20:30 h. Our kind hosts from the Valamar Diaman Hotel have prepared an excellent menu, presenting the diversity of national and local cuisines, accompanied with the regional selection of vines. However, our idea of the banquet dinner is to have a good time, and not just to enjoy the food. Therefore, prepare your dancing shoes, as we’ll be entertained by one of the best Croatian party and cover-bands coming from the City of Zagreb: the Live Legend. Impressive international repertoire from Rock ‘n’ Roll classics of the 50-ies and 60-ies to top chart hits is a guarantee of the good time for all, no matter of the age. So, be ready….no bed time before 2 a.m.